Our work is open source. DocumentCloud is a tool for journalists. 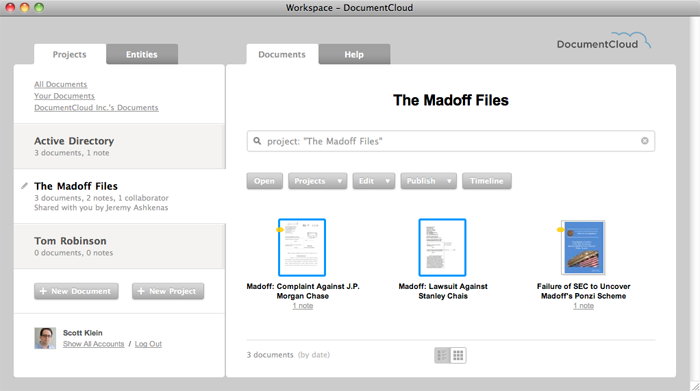 Now you can share a project with any other DocumentCloud user — in any newsroom. 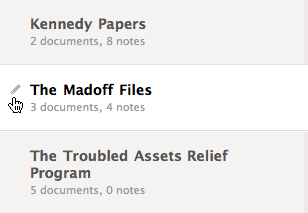 Let’s say I have a project with documents relating to the Madoff Ponzi scheme, and I want to share them with Scott. To open the project for editing, I click on its edit icon. 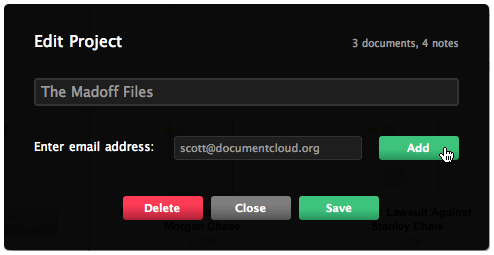 Inside of the project, I click on the “Add a collaborator to this project” link, and I type in Scott’s email address — the one that he uses to log in to DocumentCloud. After clicking the “Add” button, Scott now appears as a collaborator on this project. 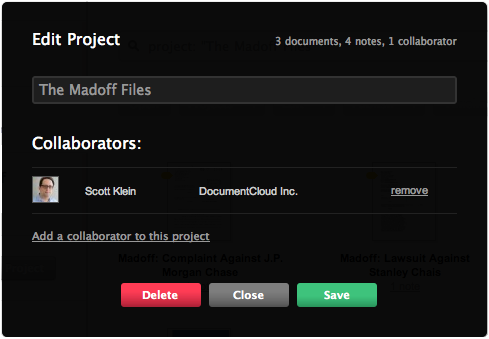 The next time Scott logs in to DocumentCloud, “The Madoff Files” will show up as one of the projects in his sidebar. He can now view, edit and annotate all of the documents inside of it. He can add documents of his own to the project and I’ll be able to see and edit those as well. Project collaborators can do anything with the documents in a project that you can do: they can edit public notes, change settings like the document’s title or source, add “related article links.” Collaborators can also add or remove additional people to the project. You can only collaborate with fellow DocumentCloud users, though: if you’re collaborating with a newsroom that isn’t yet part of DocumentCloud, send them our way and we’ll get them set up. We’d love it if you would give it a spin and let us know what you think: write to support@documentcloud.org or suggest improvements where fellow users can weigh in as well: in our support forum. While we can see the utility of such a tool, our primary purpose is to support investigative reporting and to help reporters make more documents public. If you’re working with material that is not on a path to publication, you’re probably not a good fit for DocumentCloud.